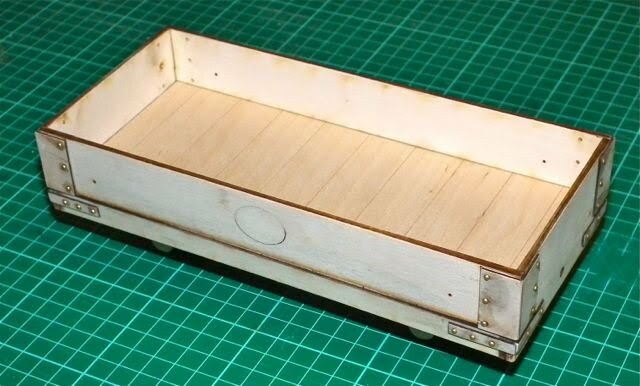 My adventures in 7/8ths" scale have mainly been focused on locos and so I have tended to scratch build my rolling stock, to freelance design, as cheaply as possible. 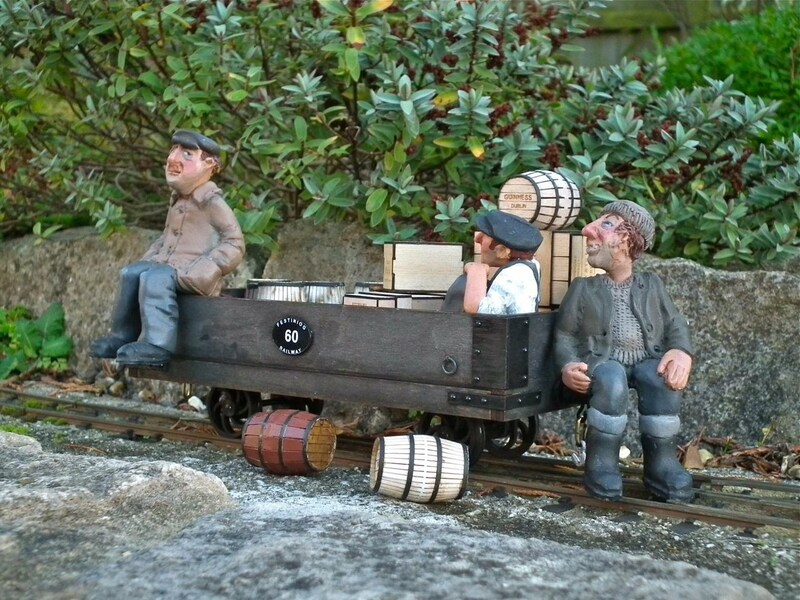 A couple of years ago, I did build one of Raif Copley's superb Quarrymens' Coaches (available from Jurassic Models), but then it was back to the cheap and cheerful. 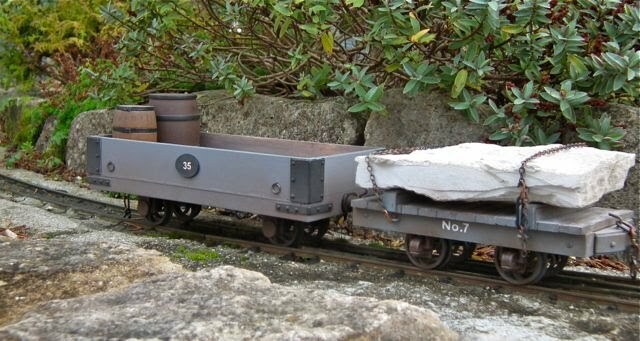 In the meantime, Raif has been working on a range of models and has started to produce simple, bargain priced models under the RMC Models banner. 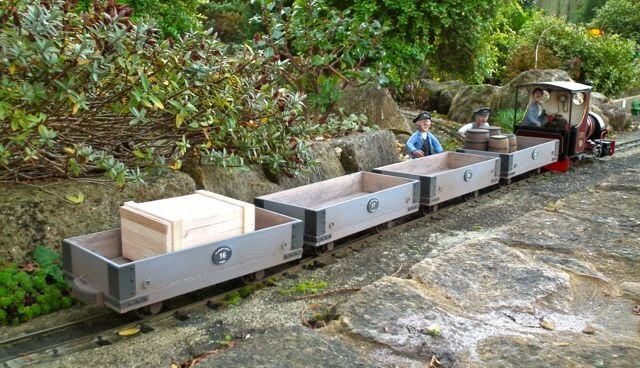 By the purest chance (Raif left it at an exhibition) his model of the Festiniog one plank, fixed side, open wagon ended up briefly at the Summerlands Works Railway (that's the 7/8ths bit) and some of the lads made free with the contents (well it was originally used for transporting beer!). 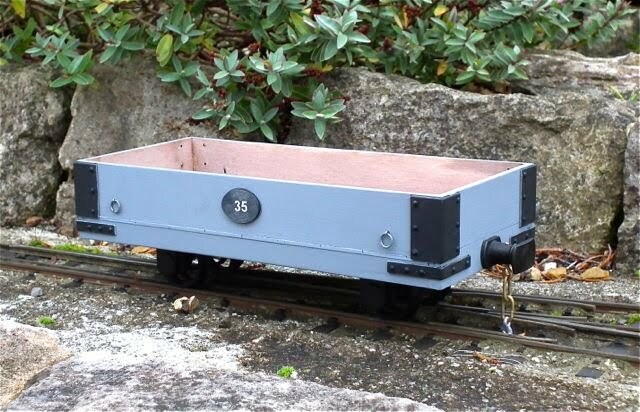 Now this version is for 45mm track (2ft) and has inside axle boxes, like the original, but Raif informed me that the kit (a mere £23 each from raifmcopley (at) aol.com) comes with parts for 32mm and outside axle boxes, which I prefer. Two days later the kit arrived and, although it comes with excellent instructions, I thought a few notes here might be useful. Well, when I finally opened out the kit, and found that not only were tiny rivets included, but that Raif had even drilled the holes - I was a happy man! 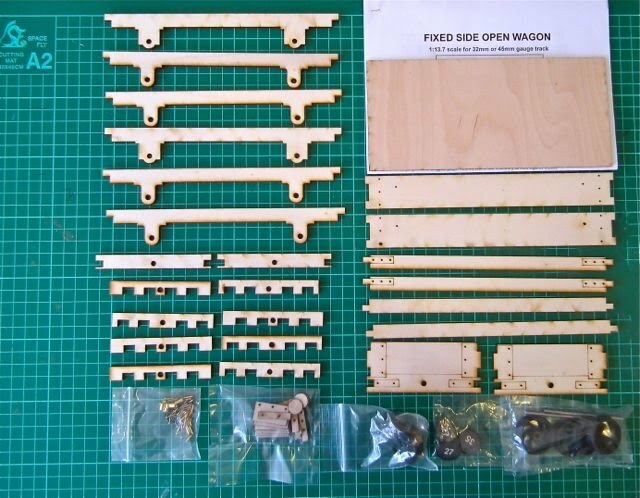 In fact building this kit was like a pleasant holiday compared with scratchbuilding - everything fitted and had been so carefully designed and cut to the nearest micron! And here it is - all laid out. A quick read of the instructions and it all made sense. The instructions are great and I used a waterproof PVA glue dispensed from a syringe. I found it handy to have a damp paintbrush to remove the oozing glue when I clamped up the parts. It is also handy to have lots of clamps. Raif uses bulldog type paper clips in the instructions, but could I find mine? No - so it was the cheap plastic clamps and some designed to hold tomato plants to canes! The underframes were first, and after starting to smear glue on the centre part, I remembered that it should go on the outer parts which are smaller. Above you can also see the end spacers. There is a choice here so I used the ones intended for 32mm and outside axleboxes. When gluing together, it is essential to check and re-check that they are all square and matching properly. They can slide when the clamps go on, but there is plenty of time to align them. Next are the side frames which must be glued in pairs with the engraved lines to the outside - not like the top one below which I spotted a lot later!! Next came the wagon ends - I got this right! And now for the assembly. I used my modelling board to ensure all was square, but this is not essential. With hindsight, I would have ensured the floor planking lines went over the edge, by opening the cut with a modelling knife to show the plank ends. It is then a matter of getting the parts the right way round and the right way up and gluing the right surfaces. The it all fits together easily and in my case comes apart easily to get the sides the right way up. I did read the instructions, but in the heat of the moment it is easy to forget (I blame the camera!). Below you can see that the correct way, with the fine line at the top on the outside. 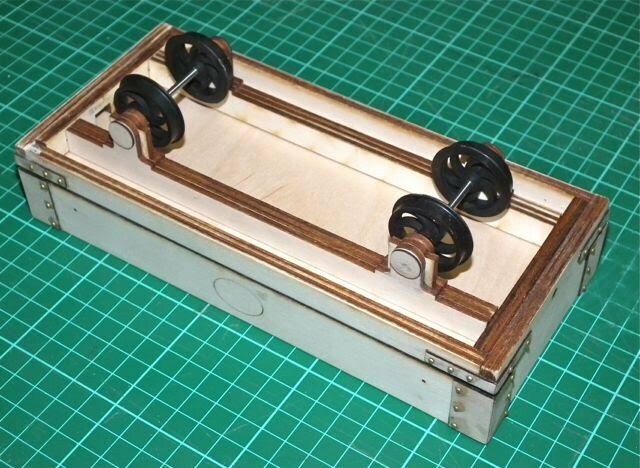 When I got it right, I put a piece of board across the top and a weight to ensure that the sides stuck to the floor. Next it was time to glue on the reinforcing on the corners and frame. This represents iron, but is made of ply and there is a right way up and a wrong way. It is pretty obvious when you look carefully! 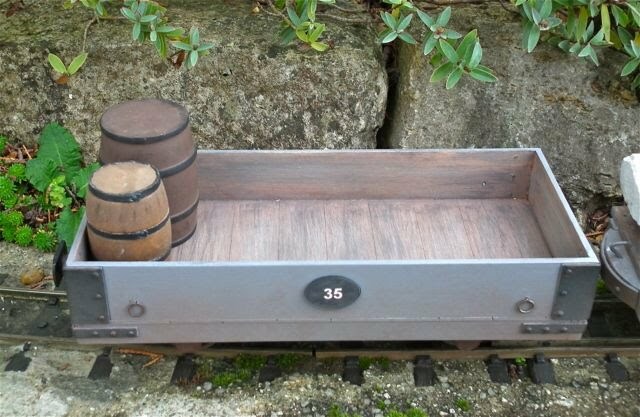 The hole nearest to the edge is the right way and this brings the top just below the top of the wagon plank. I filled any gaps with fine surface wood filler and sanded all smooth before the next step. It would probably be better to lightly sand all the wood before starting as this would mean less awkward sanding at this stage. 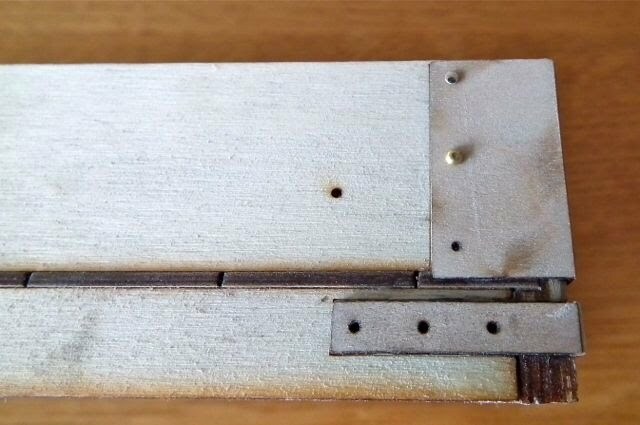 Although the holes are ready drilled, it is important to run a drill through to clear any glue and to run through the inner frame planks on the frame. I then superglued the brass rivets in place, cutting some short before insertion as it is important that the rivets do not interfere with the end frame spacers. For the corner ones on the one plank, I just snipped them off inside with small side cutters. Do beware the superglue - i did stick myself to the side once! Then I trial assembled the underframe. I had glued the axlebox covers on, as I would be using outside frames, and then shortened the axles a little. They are easy to cut with bolt croppers - or a hacksaw. Then I tidied up the cut end with a file and pressed the wheels on to 28mm back to back. And here is the underframe. At first I thought the frame spacers wouldn't fit - but when I got them square on, they slid in perfectly. As they are held by the coupling screw, it would be possible to make up wheel and spacer sets for 45mm as well, to allow them to be swapped. By this stage, I had spent no more than a couple of very pleasant hours working on the kit, and that included some glue drying time and photography. So it was add the centre buffers (superb quality blacked steel ones) and out to check it on the track. All was well on the track, so I removed the underframe to be sprayed with primer and then matt black axrylic. I masked the inside of the wagon body and inverted it on a block for spraying. Before that, though, I cleaned the brass rivet heads with thinners and then touched them in with some etch primer (sprayed into a bottle lid). I gave it a couple of coats of Halfords acrylic grey primer to match my other rolling stock (I gather from Raif thet the original on the Ffestiniog railway is all black) and then left it in the warm for an hour or so before lightly rubbing down with 600 grade wet and dry (used dry). A dust off and then two more coats. After leaving all overnight to dry, I stained the inside with an acrylic wash of brown, black and white. Raif suggests dilute indian ink and with hindsight I should have used more black in the wash. it is going to be weathered a bit though, so no matter. Next was painting the "ironwork" black with black, water based acrylic paint. When that was dry - in a few minutes - I fitted the rings as per instructions. It was then a matter of choosing which number to use. Raif provides a choice of three which are laser cut on laminated, white on black acrylic. The laser burns off the white - clever stuff! If I were building a rake of these I might ask nicely if I might commission some bespoke numbers. In the end, I chose 35 and fixed these with double sided tape so I can change my mind! 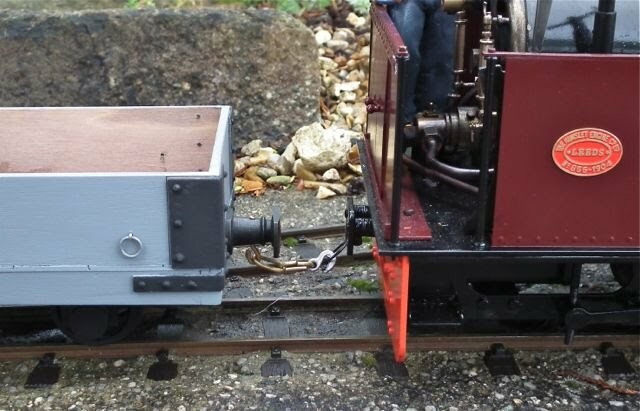 Finally I modified one of the couplings to take the chain and hook beneath as this will link nicely to my Accucraft Quarry Hunslet. But before that happens, here it is with the Jurassic Quarrymens' coach (also a Raif Copley designed kit) and my Accucraft Quarry Hunslet. The figures are, of course, by Rob Bennett! I removed the underframe(so easy!!) and then airbrushed it with a rusty, dusty brown. I use the cheapest bottom feed airbrush that I got free with a compressor. The paints are revel acrylics (in the square tubs). Lots of thin coats, dring between coats in front of the fan heater. Then I touched in the axleboxes with some slightly different rust mix. I'm not sure I can see it now, but I know it is there! The wagon body just got some light dusting coats of the rust/dust mix to make it blend in with the other stock. It gives it a warm look I think. I dabbed a bit of rust colour round some of the rivets too.The buffers and couplings have just has a coat of straight, dark brown for now as I may change them. Below you can see the finished (?) wagon. Well i couldn't just have one of these and so I ordered three more! 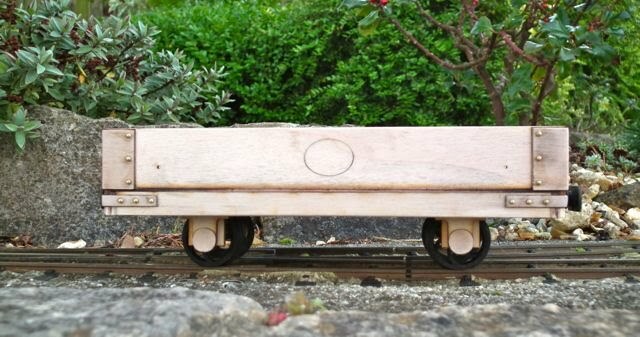 Raif has now cut the end of the planks so they show up better on the side of the wagon. 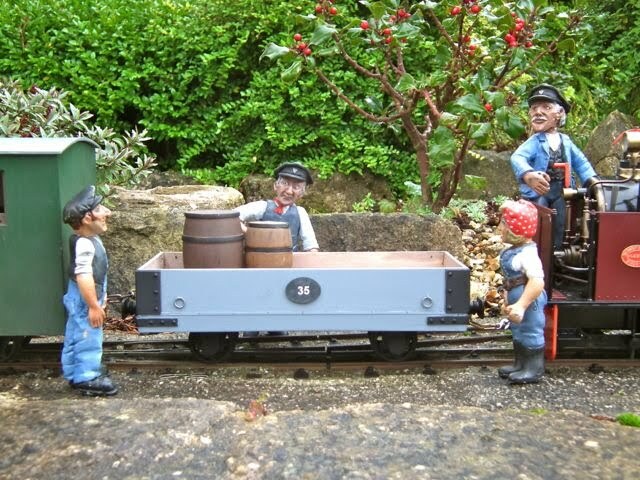 He has also had problems with sourcing the centre buffer coupling. These have significantly increased in price and to offset this, he has switched from the pricey 3/64" rivets to dressmakers' pins. The holes are smaller so that they fit well. The shortage of buffers was not a problem to me as all my other stock has simple dumb buffers. I cut and shaped these from some modelling wood I had using the bench linisher. A curve is drawn with the bottom of a pot and it is then a few seconds to shape it (mind the fingers and I wore a mask as the dust was very unpleasant. I drilled them for some 4mm bolts and shaped some panel pins for hooks (heat to red heat for an easy bend). Then some of my usual steel strip for the face, curbed and drilled for two rivets. Plasticard or thin ply would have been easier! It is a bit of a pain that the hook needs to go where the bolt runs through, but I drilled through both and the shank of the hook secures the bolt and stops it from turning. Incidentally, I drilled the hole for the bolt undersize so that it screws in. Here it is painted and weathered a little by airbrushing with a wash of mostly Revell Leather Brown acrylic with some Humbrol matt varnish. I used 50% bio-ethanol and water to make it quick drying. I weathered the underframes and wheels off the wagon as they need quite a bit. 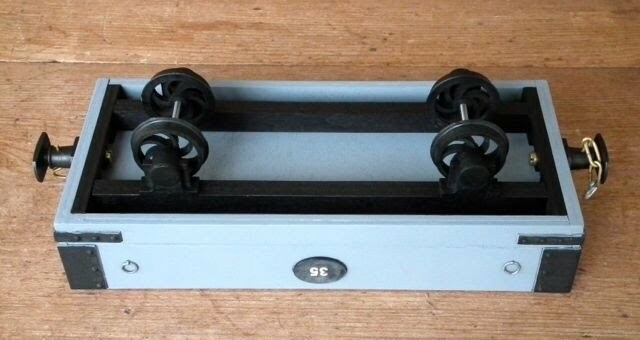 I found that a grain of Blutac held them together and, in fact, I left it there when fitting them to the wagon as it made for a firmer fit. They can still be easily removed to change gauge.